Policy Differences in Large-Loss Fire Insurance Claims | The Voss Law Firm, P.C. Insurance payouts are usually the only way business owners can repair damages and move on after a large-scale fire, so it is important to have as much information as you can before choosing your insurance coverage. Attorney Bill Voss has seen large-loss fire claims underpaid or even denied based on the limitations of the commercial insurance policy, and problems in coverage can easily cause businesses to fold. Risk assessment changes. Insurers typically perform risk assessments before insuring a building or property. These determine how likely it is that a fire will occur, and adjust their rates based on these factors. Since additions to the property can change fire risks—for example, installing gas stoves in an apartment building or the opening of a restaurant on the property—it is vital that you report changes to the insurer to keep your policy valid. If a fire occurs on the premises and the insurer was unaware of the conditions that caused it, the insurer could have a basis to deny the claim. Cause of loss. In the days after a fire at your business, your insurance representative will examine the grounds closely to determine the origin of the fire. Insurers may attempt to convince the business owner to share blame for the accident, significantly reducing the amount of the claim. 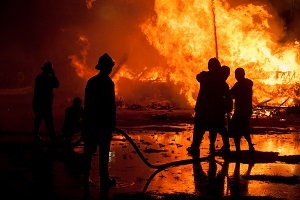 It is important to note that policyholders can hire their own investigators who are qualified to determine the cause of the fire and write a conclusive report that can be used in court. Maintenance. Most commercial policies will limit fire losses if the property owner did not perform adequate maintenance that could have prevented the fire or limited the amount of damage caused by the blaze. Policyholders can limit their liability by installing appropriate electrical and heating units, ensuring that all smoke and fire alarms are in working order, that fire escapes are kept clear, and that elevators are functioning properly. Any maintenance problems or violations of building codes can affect insurance coverage, so it is vital to attend to known issues quickly and have the your property inspected regularly. The differences in insurance coverage options can vary widely, resulting in losses of hundreds of thousands of dollars for the insured. While no two policies are the same, one thing is certain: it never pays to make assumptions about your coverage. The only way to predict how much of your losses will be covered is to read your policy carefully and review your coverage annually to make sure your needs are being met. The Voss Law Firm, P.C., protects policyholders by fighting for full and fair payment from the insurance companies. To learn how to get the maximum coverage in your commercial insurance dispute, fill out the form on this page to contact us today.